Dr. Merrill Mayper is a 2014 graduate of the Ph.D. 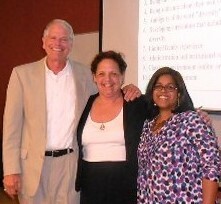 Program in Leadership & Change at Antioch University. Above: Dr. Merrill Mayper at her Dissertation Defense, July 29, 2014, Yellow Springs, Ohio. Dr. Merrill Mayper was born and raised in NY and moved to Phoenix, AZ in 1974. She earned her Master of Arts in Organizational Management from University of Phoenix where she has been a Certified Advanced Facilitator since 2000 in both online and live classroom modalities. Currently she works for the State of Arizona as a trainer for the Department of Economic Security. Mayper, Merrill Andrea, "Teaching Acceptance of Differences and Equality across General Education Curricula: Changing Perspectives on Multiculturalism and Social Acceptance through Transformative Learning" (2014). Dissertations & Theses. 162.